Flightline AC, Inc., working in conjunction with Vertical Power, now offers an advanced automatic climate control system (CCS) for Experimental aircraft. The CCS was a natural to work with the VP-200 solid-state electrical system, says Marc Ausman, president of Vertical Power. Flightline AC provides air conditioning systems to owners of advanced aircraft such as Lancair, Cirrus and the Van’s RV-10. Pilots have been asking for automatic CCS features, says Flightline President John Strain. Using a color display, the pilot simply sets the desired cabin temperature. The CCS controls the air conditioning fans and compressor as well as the servos that open and close hot-air valves. A small CCS control unit mounts in the back of the cabin and provides solid-state power control and circuit protection to the fans and hot-air servos. 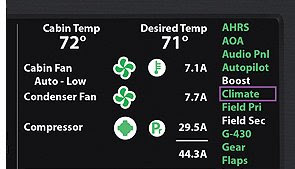 The display shows the status of the overall system, and the status of fans and sensors as well as pressure and temperature switches. Included is information about how much current each fan is drawing and any fault detections (overcurrent, short circuit, no current draw), which makes troubleshooting the system easier. The VP-200 system and the CCS are designed to work together and many CCS functions are controlled in the same manner as would be any other electrical device. Two inside air temperature sensors accurately measure cabin temps. For more information and pricing, visit Flightline AC or Vertical Power.